A nippy rover from one of Australia’s great football families, Jimmy Carroll played just two senior matches with Carlton in a career that lasted less than one full season, but both games were memorable for different reasons. Jim was a cousin of “Turkey Tom” Carroll – who by 1961 was already making a big impact at Princes Park after being recruited from Ganmain, NSW, earlier the same year. Another older cousin; Laurie “Dooley” Carroll, had played 11 games with St Kilda in 1948-49, and in time, Dooley’s son Dennis (and nephew, Wayne Carroll) would both go on to impressive careers with the Sydney Swans. 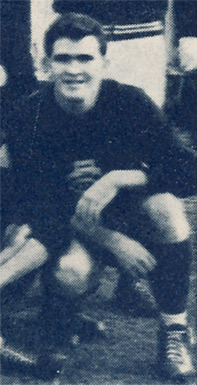 After finding his feet in the Blues’ Reserves team, Jim was included in Carlton’s senior side for the first time in round 18, 1961 – the last round of the season. Carlton’s opponent was Melbourne, who were sitting solidly second on the ladder, and expected to have little trouble with the eighth-placed Blues. Wearing guernsey number 42, Jimmy sat on the bench as 19th man and got just the briefest of runs as the Navy Blues took the game right up to the Demons – leading by 20 points at the last change, before being nosed out by a solitary point on the final siren. Tom Carroll kicked five goals for the Blues that afternoon, taking his season tally to 54 and capping his debut season with Carlton’s first VFL Leading Goal-kicker award since Harry “Soapy” Vallence in 1931. A few days later, tenacious defender John James made it a double celebration when he was awarded the Brownlow Medal as the fairest and best player in the game. Jim Carroll didn’t get another opportunity at senior level until round 5, 1962, when Carlton and Essendon – destined to meet in that year’s Grand Final – clashed for the first time that season at Princes Park. Having swapped to guernsey 34, Jimmy warmed the bench again until the third quarter – but when he did eventually run on to the ground, it didn’t take him long to get noticed. While Essendon controlled the match, Carroll did his best to aid the fightback by snapping two neat goals, then caused jaws to drop right around the ground when he tangled with the Bombers’ rugged defender Ian “Bluey” Shelton - and was reported by three umpires for striking. At the tribunal hearing, Jimmy pleaded provocation – but it didn’t save him and he was suspended for two matches. That blow to Jim’s aspirations brought an abrupt end to his VFL career. He served out his penalty, played a few more Reserves matches, then headed back to Ganmain before the season was through. 1961 - Reserves Best and Fairest Award. Contributors to this page: Bombasheldon , PatsFitztrick , molsey , tmd1 , p(12)terg , Jarusa , keogh , true_blue24 and admin . Page last modified on Monday 06 of May, 2013 22:31:26 AEST by Bombasheldon. 1995 Rd 7 - Ratten leads Blues out of Bomber rut.